Del Webb Florham Park is an upcoming 55+ community located in the borough of Florham Park, New Jersey. This active adult community will feature a large clubhouse with many resort-style amenities for residents to enjoy. An on-site lifestyle director will help to plan additional activities, seminars, and classes. And residents will have a wide selection of home models and floor plans to choose from. Located in Morris County, Del Webb Florham Park will provide easy access to all kinds of dining, shopping, and entertainment opportunities. Del Webb Florham Park will have a modern, 15,000 square-foot clubhouse where residents can pick up a new hobby or continue a lifelong interest. Included in this clubhouse will be a state-of-the-art fitness center, indoor pool, and multi-purpose rooms to read, chat, or play mahjong. Outside, there will be an outdoor pool and a patio for relaxing on sunny days. With several courts available, homeowners can challenge a friend to a game of tennis or pickleball. Plans also call for activity spaces, gardening plots, and a fire pit, perfect for s'mores when the grandkids come to visit. 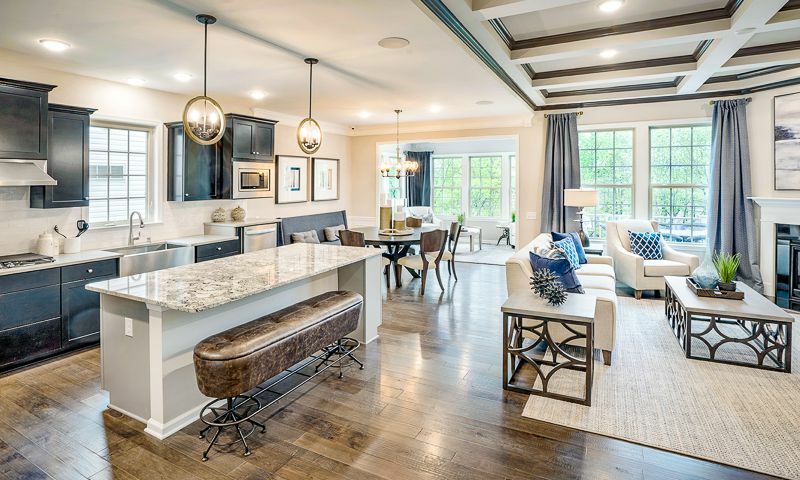 Del Webb Florham Park will consist of two separate home collections, each with three unique floor plans. The Manors collection includes single-family homes ranging from 1,676 to 2,026 square feet of living space. They include two to four bedrooms, two or three bathrooms, and two-car garages. The Carriages collection has attached homes that range from 2,142 to 2,421 square feet of living space. They also have two to four bedrooms, two to three bathrooms, and two-car garages. All homes will have open floor plans, modern kitchens, and flex spaces. With a 24-hour lifestyle director, Del Webb Florham Park residents will always have active options within their community. Physical fitness and wellness activities will be readily available with constant access to the pool and fitness center. Classes, clubs, and social events will be offered in the clubhouse on a regular basis. Lawn and community maintenance are sure to be included by the homeowners' association (HOA), which means residents can spend less time worrying about chores and more time enjoying life. Located in New Jersey's Morris County, the borough of Florham Park is located close to several downtown areas and retail centers. A number of shopping and dining options are conveniently located in downtown Florham Park, Madison, and Morristown, all of which are less than 15 minutes from the community. Grocery shopping is easy to do at Kings Food Markets and Trader Joes, both of which are less than five miles away. Fans of the New York Jets will be excited to know that the community located right next door to the NFL team's headquarters. For health concerns and care, Morristown Medical Center is located just down the road. For residents interested in exploring the region, the community is located close to the junction of Route 284 and Route 24, making it easy to get just about anywhere in the state. Depending on traffic, you can be in New York City within 45-60 minutes. A trip to the Jersey Shore takes about an hour and you can press your luck in Atlantic City within two-and-a-half hours. For long-distance travel, Newark Liberty International Airport is less than 30 minutes from Del Webb Florham Park. There are plenty of activities available in Del Webb Florham Park. Here is a sample of some of the clubs, activities and classes offered here. The Manors collection includes single-family homes ranging from 1,676 to 2,026 square feet of living space. They include two to four bedrooms, two or three bathrooms, and two-car garages. The Carriages collection has attached homes that range from 2,142 to 2,421 square feet of living space. They also have two to four bedrooms, two to three bathrooms, and two-car garages. All homes will have open floor plans, modern kitchens, and flex spaces. 55places.com is not affiliated with the developer(s) or homeowners association of Del Webb Florham Park. The information you submit is distributed to a 55places.com Partner Agent, who is a licensed real estate agent. The information regarding Del Webb Florham Park has not been verified or approved by the developer or homeowners association. Please verify all information prior to purchasing. 55places.com is not responsible for any errors regarding the information displayed on this website.